HarperCollins. Hardcover. 0060004398 Ships promptly from Texas. . Fine. 2004. HarperCollins. Hardcover. 0060004398 . . Fine. 2004. HarperCollins. Hardcover. 0060004398 Autographed by author! Ships promptly from Texas. . Very Good. 2004. HarperCollins. Hardcover. 0060004398 Ships from Tennessee, usually the same or next day. . New. 2004. Scranton, Pennsylvania, U.S.A.: Harpercollins Childrens Books. Glossy pictorial boards with bright yellow background. No Jacket. Stated first edition. Binding is tight and square. Pages are colorful and clean throughout. A nice gift inscription on inside page. 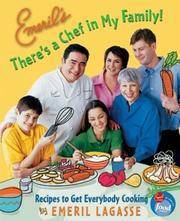 Provides tips for having fun and keeping safe in the kitchen, along with dozens of world famous chef Emeril Lagasse's favorite recipes that families can make and eat together. . Very Good. Hardcover. 1st Edition. 2004. HarperCollins. Hardcover. 0060004398 . . New. 2004. HarperCollins, April 2004. Hardcover Hardcover. Used - As New. HarperCollins. Hardcover. 0060004398 Ships promptly from Texas. . New. 2004. HarperCollins. Hardcover. 0060004398 Thousands of Happy Customers! . Very Good.